My family had a great time on our recent road trip to Monterey Bay and San Francisco. Here is the first layout from that trip. I decided to print a collage first - using Serif Plus 4 to create the photo triptych, and title. Then I designed this sketch with the idea of the image/s as a panorama, again using Serif Plus 4 software. Here is my layout using that sketch. I layered several different papers and cardstocks, including some travel related text, and colors that echoed the colors in the photos. 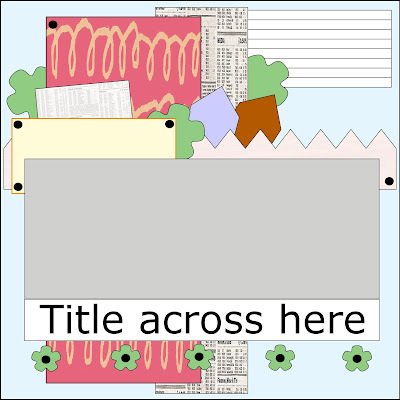 I used rub on flowers and a border pattern, because they are flat, then started gluing down the papers with Best Glue Ever. I inked some edges and stamped a simple image as a background for a tag, drying the ink with the Perfect Crafting Pouch. The embellishments add dimension. Best Glue Ever glued paper, cardstock, chipboard and plastic buttons. The other tool I used was the Tim Holtz Tiny Attacher. 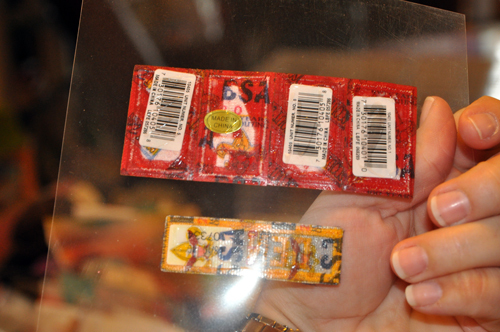 Fun Tip: Add a simple pocket to hold your souvenirs. What is most fun about this layout for me is the pocket where I have inserted the toll invoice for our bridge crossing. My plan is to make one on each page of my vacation spreads to keep the souvenirs, like room keys, brochures and tickets. All I did was run tiny dots of Best Glue Ever around two sides and the bottom of my chosen piece of cardstock and place it before putting down the the image. I added some tiny staples - but really they were for decoration rather than to hold the pocket. I'd love to see your versions of this sketch. If you do use it as inspiration, please tell us in the comments. 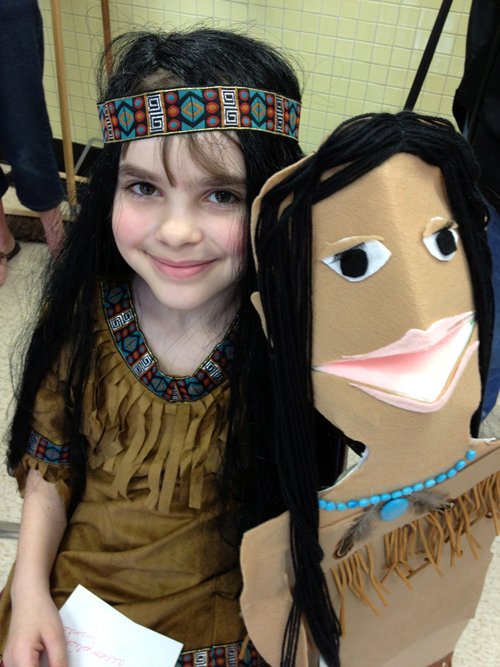 For her school's biography day, the third grade students are assigned historical figures to research, report on, dress up as, and make a puppet. 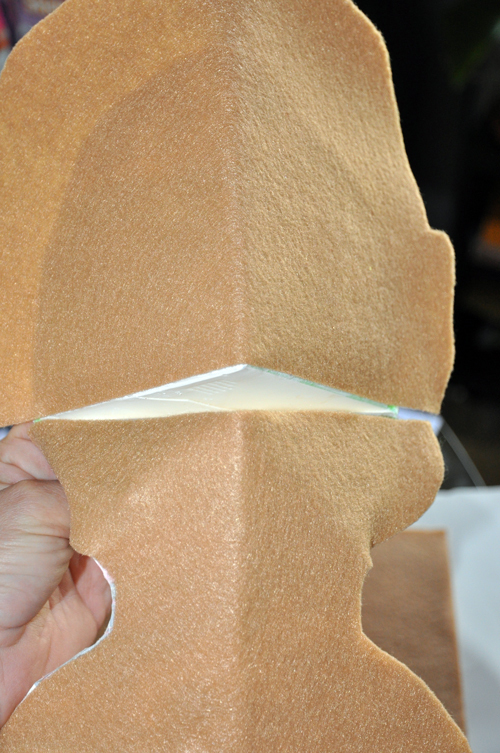 The most onerous part is making the puppet, but with the Best Glue Ever it came together quite easily. The puppet starts with a juice carton head (mostly) and the kids are given patterns to make the face, arms and legs. We used felt for the body and foam sheets for her dress. My daughter applied the Best Glue Ever all over the carton and let it dry until it was tacky. 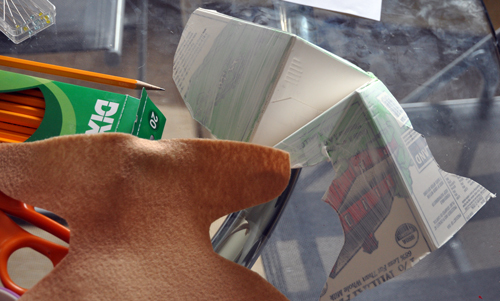 After the glue dried she placed the felt face on the carton. 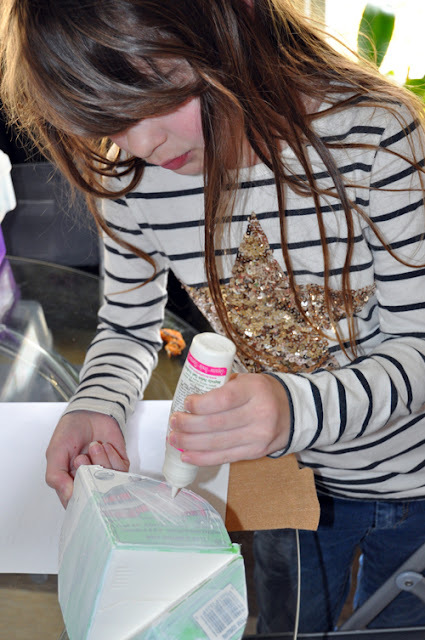 The Best Glue Ever made it a piece of cake! She went on to add eyes, lips, arms and a dress using the Best Glue Ever to glue everything down. I tried to offer to help, but she insisted on gluing it all herself. I may have to hide my bottle from her now! 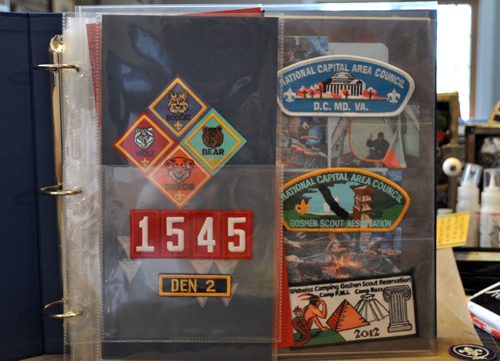 As part of the Cub Scout scrapbook for my son I wanted to include some of his uniform patches. Yesterday I showed you how I adhered them to cardstock. Today I've got another tip for you. I bought an extra set of his pack numbers to use in the scrapbook. I'd debated on where to put them - inside on the page with his earned ranks, on the front cover or on the spine. In the end I decided to give them there own separate page, but with a twist. A clear page! First I cut a transparency to fit a 6"x6" page protector. 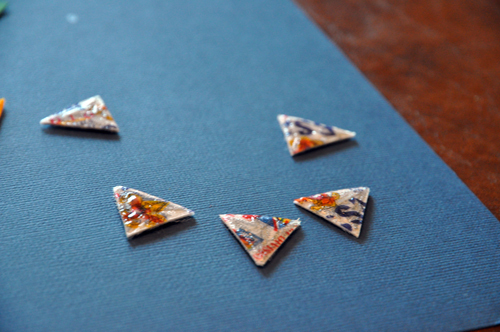 Then I applied the Best Glue Ever to my pieces and let them dry until tacky. Since these are a bit heavy, I added a bit more glue than I usually would. And here you can see nice and clear the glue dries! 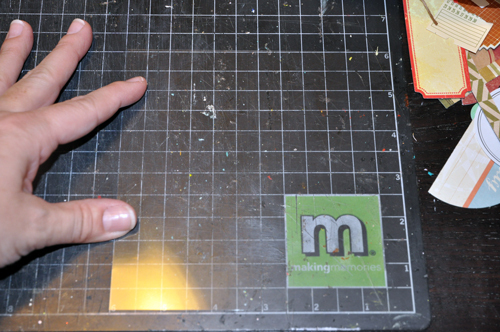 And here's your tip: before adhering the pieces to the transparency, I placed it on my craft mat. I made sure the transparency was all lined up so I could easily find the middle. Now it was easy to center my numbers on the page. I started with the middle two, lining them up on either side of the center. Being able to see the craft mat underneath made this super easy. And here's the back. You can't see the adhesive - except for a couple places where it crossed the sales tags. 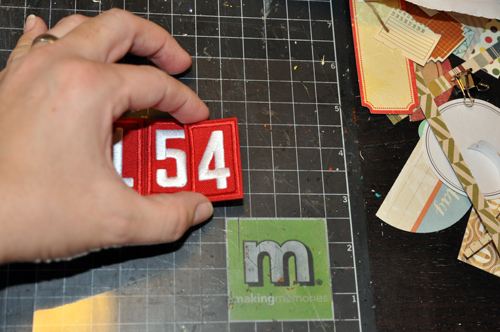 If I had taken a craft stick or my finger to apply the glue over the entire back of the numbers you wouldn't see it at all. And here's the page in the album. 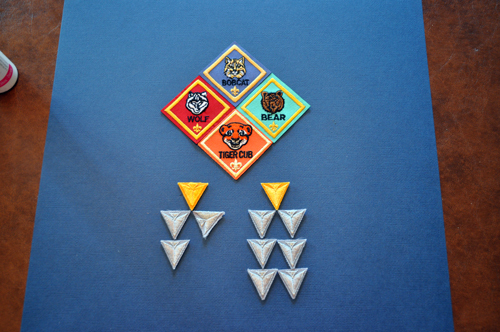 You'll notice from yesterday's post that I decided to crop the cardstock page with his Cub Scout ranks to a 6 x12" page, which fits nicely on the left side of the page protector. The right-hand side of the protector has an assortment of shoulder patches. I will be sewing these into the pockets, in case they need to be used on a future Boy Scout uniform. Best Glue Ever for Ephemera! As my son has transitioned from Cub Scouts to Boy Scouts, I've been busy putting together a scrapbook covering his time as a Cub Scout. I wanted to have a page in the front that mimics his uniform, with all the levels and arrow points he earned. 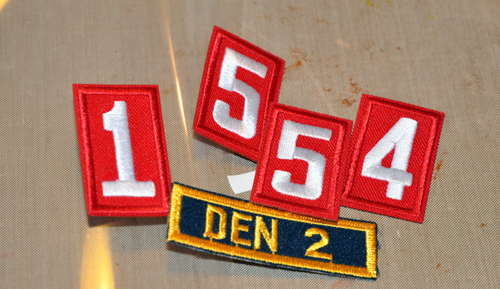 If you've seen these in real life, you'll know that these patches are thick and kinda slick on the backside. However, a bit of the Best Glue Ever was all it took to adhere them onto my page. I laid out all the patches onto my cardstock first. 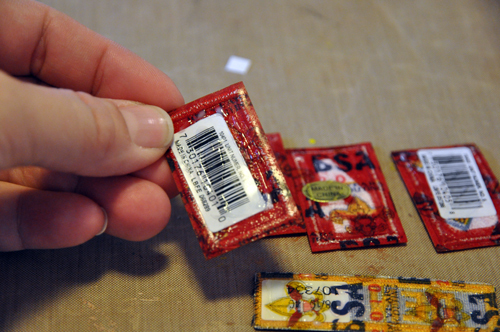 Then, I carefully picked up the badges, turned them over and applied the Best Glue Ever. 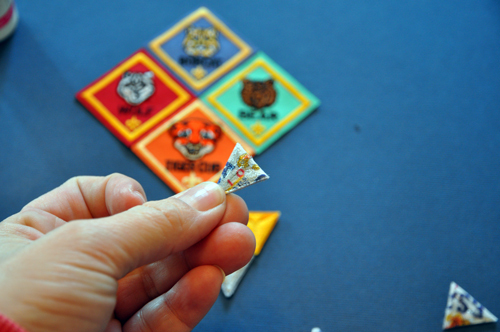 I let the glue dry until it was tacky before turning the badges right side up and adhering them. Except for those arrow points - it was easier to just set them aside and add them afterwards. 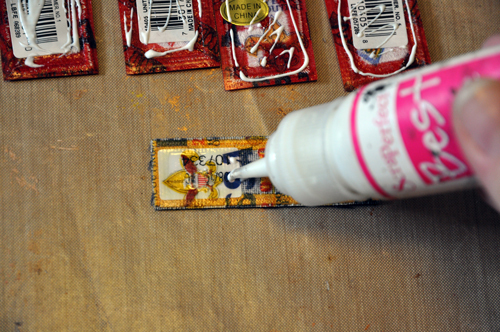 The glue is easy to apply and dries clear and tacky - no running or bleeding all over your page! It makes it so easy to put together a page like this. And I don't have to worry about the patches falling off. And here's my finished page, ready for the album.